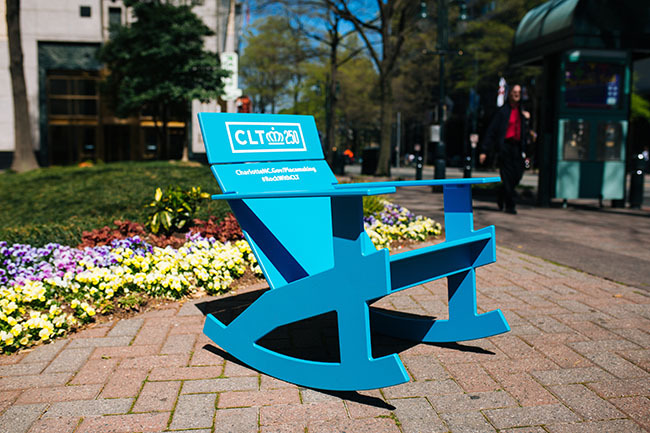 Taking a note from the airport, the city of Charlotte is looking to give residents and visitors a taste of Southern hospitality as they placed 100 rocking chairs in 25 locations around Uptown for use by the public this week. In addition to celebrating the city’s 250th anniversary, the chairs are also meant to provide physical spaces for locals to sit back, relax and initiate conversations about how to better utilize public spaces within the community. The project is part of the city’s Placemaking program, established by the Urban Design Center in 2018 to focus on tangible improvements to common spaces. The rocking chair project is a year-long initiative to provide a direct link between the city and the community, inviting residents to propose projects that will enrich and better utilize public areas. Each chair displays the Placemaking program’s official website, designed as a user-friendly guide for residents and businesses to locate resources for funding and grants, guidelines for implementing projects in public spaces and step-by-step instructions for the permit application process. The site, part of a larger outreach and improvement project, also features a ‘Placemaking hub’ that lists a variety of community initiatives for residents to get involved in, including community cleanup efforts like Adopt-A-Stream, artistic endeavors like Paint the Pavement or other projects like building parklets. The website also features a map to help find rocking chairs closest to you and invites users to participate by sharing their stories about community improvement on social media with the hashtag #RockWithCLT. The rocking chair project is the first of many upcoming projects planned for the city that align with the program’s intent to engage with the community and provide a platform for residents to share and execute community projects. So get engaged or just sit and rock. The next move’s on you.